We do have the bedroom signs in A4 - product code 19078 - there is room on these to add a name and picture, but unfortunately, we do not have the activity sign in A4. Our Personalised Bedroom/Activities Room Sign has been designed for use in both care and residential homes. 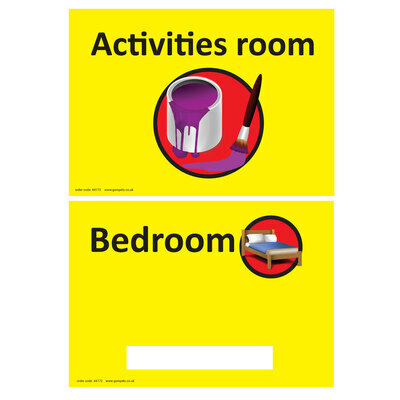 Giving your residents back their much-revered independence, these low-cost signs are double sided for repeated use.. One side has been printed with the words and graphics for the bedroom and the other for the activities room - helping to direct residents to the correct place every time. The high-grade rigid plastic coated board can be wiped clean along with your existing hygiene regime and are easy to fix securely to any wall or hard surface. We also stock our Black Sign Holder for a more professional installation and Sellotape Sticky Fixers for the securest fit. We hate seeing plain backs to signs so we've used the reverse to print another. Printing both sides is so much more cost effective, and means we can pass the lovely savings on to you with amazing low prices across our ever increasing signage range.